The Florida GOP primary festival in earnest begins after South Carolina. In perennial fashion that is the GOP candidates approach to Florida politics and garner the hardline pro-embargo vote, it all comes down to a contest of the candidates yelling fire and brimstone on U.S. Cuba relations - just how anti-Castro can the candidate get and one up the other. Short of calling for a military invasion of Cuba, it is almost comical to hear just how tough the GOP candidates would be on Cuba if they were President. "Lets double down on failure" is their theme on U.S. Cuba relations. The truth is three of the candidates are weak on Cuba. Instead of acknowledging the failure that fifty years of our policy of economic isolation and humiliation of Cuba, they still pander to this community (yes they do have lots of money and have been generally cohesive in voting). They would prefer to tell them what they want to hear instead of being leaders and telling them the truth they need to hear - that it is time to end the farce of our U.S. Cuba policy. The embargo and travel restrictions do not work. Our sanctions regime brings suffering to Cuba, the Cuban people, and ourselves. The "Cuba libre" vision they have is not even remotely possible in such an environment. The Cuban government and the Castros have effectively used their national sovereignty as the foil and shield against these abhorrent policies for fifty years. Democratic, pluralistic change will eventually evolve in Cuba. Yes, Cubans want change, but not at the dictates from our government nor their brethren in Florida and New Jersey, especially those who descended from the Batista generation and control the Congress for now. There are historical reasons that we seem to ignore why that is the case. A new generation of Cuban Americans with family and relatives on the island are going to change that dynamic. They are joined by millions of Americans from across the country who want to trade with and visit Cuba. They want a new relationship with our sovereign neighbors in Latin America, one that includes Cuba. The Cuban Americans who continue to promote our failure are essentially becoming a lost generation, choosing to be powerless and delusional for the sake of being unwilling to admit the truth of our failure and being courageous and human enough to change. But hey, the politicians will take their money and votes and continue to tell them what they want to hear. In the documentary, Will The Real Terrorist Please Stand Up, one Miami hardliner radio talkshow host referred to her city as a city of "victims" as one of the justifications for our insane policies. Why aren't our political candidates and leaders reminding this community of the hard truth, that there is no power in being a victim? Only one GOP candidate has a clue as to the direction we should take, Congressman Ron Paul (R-Tx). Like Senator Barack Obama was before he became President Obama, Ron Paul knows our embargo and travel restrictions are dinosaurs of a cold war and opposes these stupid policies. Paul understands the policy failure and the need to end American interference and institute policies of positive American influence. Similarly, Paul has suggested the one thing that is anathema to the hardliners in Florida, sitting down with our adversary and talking face to face to begin addressing a host of issues, most pressing the human issues of Alan Gross and the Cuban Five's imprisonments in both countries. Why must diplomacy lose in a world that urgently needs it right now? 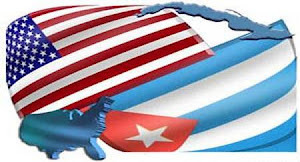 Through their traditional election pandering, these GOP candidates, with the exception of Ron Paul, will prove just how weak, ignorant, and arrogant they intend to keep our country when it comes to U.S. Cuba relations. As it has been stated before, it is really only about votes and money. The truth, common sense, and rational thinking checked out on U.S. Cuba policy five decades ago. Will we have a President who will restore that to our foreign policy in the next term of office?